Oct. 7, 2017 2:00 p.m. The fourth annual Veterans Voices of Canada Flags of Remembrance was held in Sylvan Lake to kick off a season of remembrance on Saturday. The event, which is now in 12 communities across Canada, features the unfurling of 128 flags to commemorate the 128,000 Canadians who have been killed or missing in action since the South-African Conflict until the present day. Each flag has a hero plaque with the name of a servicemen or woman on it. The plaques are purchased by sponsors and individuals, with the proceeds going to support Veterans Voices of Canada, which documents and films the stories of Canada’s veterans. Allan Cameron, founding executive for Veterans Voices of Canada and Flags of Remembrance, was in Sylvan Lake this year to mark the occasion, after being in his hometown of Sydney, Nova Scotia last year. The moment of seeing the flags unfurled moves Cameron every single year. Cameron hopes to continue to grow Flags of Remembrance in order create a season of remembrance in Canada. “Remembrance Day should be everyday,” he said. Sylvan Lake Mayor Sean McIntyre, who spoke at the event, is pleased to have Flags of Remembrance be something that Sylvan Lake is known for nationally. 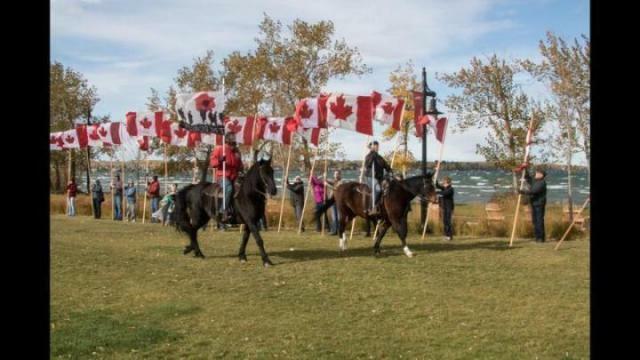 “It is really incredible to see Flags of Remembrance expand from Sylvan Lake and move out across the country,” he said. “It brings this one day of Remembrance Day and stretches it out into a season of remembrance and a season of honour for those who have served and given the ultimate sacrifice. Following the event, the 128 flags are placed along Hwy. 11 until Remembrance Day on Nov. 11th. “It is wonderful to see it catch on and it is wonderful to see more and more people come be part of the opening ceremonies,” McIntyre said. “People will be driving past the flags on Highway 11 for the next month, which is very powerful visual. Cameron said he was overcome from the support of the Sylvan Lake community. “I am proud of all the support here and all the volunteers. It’s growing and I am so happy with it. I can’t ask for much more than this,” he said. He added he hopes that people will take the time to thank veterans when they see them on the street.